The Fluval M Series Aquarium Heaters feature a reflective look which makes them blend into their surroundings. This may be especially appealing in applications where there is no sump, and the heater is in full view. The Fluval M Series Aquarium Heaters are made in Italy and are put through an extensive series of testing to ensure superior performance. The new temperature dial offers easy handling and adjustment. 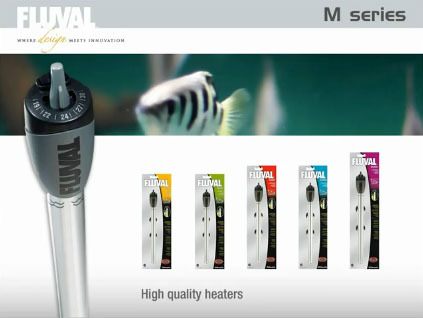 Fluval M Series Aquarium Heaters can be used in both saltwater and freshwater applications. The M Series Heaters are offered in the range of 50 – 300W.